Pages: xxi + 255 pp. Many modern polytheists are familiar with the Athanassakis translations of The Homeric Hymns and Hesiod’s Theogony, Works and Days, and Shield, also published by Johns Hopkins. A further number are familiar with his translation of The Orphic Hymns that was published in the late 1970s by Scholars’ Press, and which rarely sells secondhand for exorbitant prices online. The release of this further volume of important Greek hymnody by Johns Hopkins, newly revised and edited by Athanassakis and Wolkow, will be a welcome addition to anyone’s library. It is rare that I can give such an overwhelmingly positive review of a book, and to suggest from the start that it will be essential reading and owning, as it were, for absolutely everyone whose eyes might fall on this review. I find this to be the case for the present book. I cannot imagine any modern polytheist from any tradition, any pagan of whatever stripe, or any scholar interested in the ancient world, poetry, or religion not being able to get some benefit from owning and reading, and repeatedly studying and referring to, this book. While The Orphic Hymns are not as old as The Homeric Hymns, Hesiod, or many of the other more ancient Greek poetic texts which are so important to modern polytheism, they are from late antiquity, and represent a unique and important theological voice within ancient Greek polytheism. 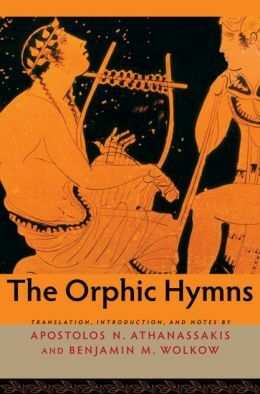 The attribution to Orpheus is, of course, pseudepigraphic, but the theological context of the Orphic initiatory traditions seems to play into several parts of the hymnic collection as it currently stands. While Thomas Taylor’s rhymed (and often Romanized) rendering of this text is widely available, and is an important source in its own right, it is a few centuries out-of-date in terms of its linguistic understanding, as well as its wider historical and contextual placement. Thus, Athanassakis’ translation will remain extremely important for that reason alone. Further, the notes (which comprise the majority of the book) are also a resource that is comprehensive, while still remaining within reasonable bounds as the appendix of this translation. Each hymn’s notes give an introduction to the deity it celebrates, both in their traditional Greek cultic and mythic context, as well as in relation to what we do know of Orphic theology from the extant fragments. For the deities included in the collection, each of these serves as a brief summary of the deity on par with some of the best dictionary and encyclopedia sources on Greek deities; while it does not give the extensive excerpts from the texts cited which the Theoi Project does online, nonetheless this is an extremely useful portable source of that sort, along with being of potential utility in the portability of the text itself. One matter of attention in the notes as well which is useful is the noticing of the sequencing and grouping of the hymns in the collection. It construes them in various series, often of a divine-functional nature, starting with the most abstract and abstruse deities at the beginning of creation and eventually spanning to more anthropomorphic deities in a variety of other groups later. It also understands the entire corpus to be intended for recitation or performance at a likely all-night ritual, which seems not only plausible, but might in fact prove to be a potentially productive ritual to enact for modern polytheists. While most of the “usual suspects” of the Greek pantheon are present in the eighty-eight hymns plus their prologue — including Dionysos (in several forms and epithets), Zeus (also several times), Hera, Hestia, Hekate, Artemis, Athene, Hephaistos, Apollon, Hermes (twice), Hades (as Plouton), Persephone, Demeter, Poseidon, Aphrodite, Eros, and Pan — and many other of the Titans and earlier generations of deities, several lesser-known deities, heroes, and natural forces are also celebrated in the collection. Many of these will be familiar (like Leto, Semele, Nereus, Proteus, Nike, Herakles, and others), and some will be less so (the Kouretes, Palaimon, Leukothea, Physis, and Sabazios). A few I had not heard of at all or extremely rarely previously, including the Thracian goddess Hipta, and Mise, who is a feminine form of Dionysos (!?! — who knew?!?). And, one might also be surprised that there is simply a hymn “To The Titans” as well, and several better-known deities are said to be “titanic” in various ways in their individual hymns (e.g. Apollon on p. 30), which needfully nuances the rather dualistic view many people who worship the Greek deities seem to have when it comes to the Titans (and which has not been helped at all by some modern cinematic treatments of them). I only have two critiques at all of the text, neither of which should disqualify it for the highest consideration and prioritization in terms of future wish-list items for everyone reading. The first is the rather interesting rubric that accompanies the majority of the hymns in the form of an appropriate incense to burn in offering for the deity concerned. The correlations between different deities who are given the same incenses is never really addressed — and such a correlation might be intriguing to consider — but likewise, despite the ritual contextualization that the order of the hymns suggests to the editors/translators, the more directly physical and olfactory component of the proceedings is almost entirely ignored, which is unfortunate as a missed opportunity for further comment. The second critique is a theological one, which is not the sole responsibility of Athanassakis and Wolkow to answer, but which remains an issue for more serious consideration by all modern polytheists who read the text. The various hymns in the collection sometimes give the same or similar epithets to a variety of deities, or even include a name of another deity in the hymn as if that deity is likewise addressed. The editors/translators suggest these are equations between the deities in a syncretistic fashion, but it is very clearly not the case by necessity. Because poetry is poetic, the use of metaphor is quite common. Thus, to say that Plouton is the “Chthonic Zeus” (p. 18) is understood to be a metaphor, and there is little question of this being the case. The epithet Paion or Paian, which originally referred to a separate deity but was eventually used to emphasize the healing aspects of Apollon, is applied in this text to Apollon, Helios, Herakles, Pan, and Asklepios. While this indicates a potential shared relationship between them in terms of healing, this does not necessarily indicate that the deities are equated or are “the same” or “interchangeable.” Helios’ hymn also addresses the sun-god as Zeus (p. 10), and while the editors/translators suggest in their notes that various ancient sources synonymize Zeus and Helios as all-knowing and as all-father, I would personally note that this does not necessarily mean that they are the same, or even that the text of this hymn is indicating the same thing (nor are the others when they do something similar). In the same way that one could praise Johnny Carson as “the George Washington of late-night television” without anyone assuming that Johnny Carson is George Washington in a literal sense, so too must one understand the poetic metaphors in this translational syncretism occurring in this text (and many others) as simply comparing two deities through metaphor, rather than understanding these as direct references by the ancients to the oneness of these particular deities or reducing their comparability to unity and identity. Many deities in this text are said to be all-mothers or all-fathers, and yet they remain quite distinct in cult, mythic narrative roles, and a variety of other ways. Clearly, something far more metaphorical is going on, and polytheist readers should start becoming more aware of that, even if scholars are not clear on it, nor might they have any interest in a further theological nuance in these regards. The hymns themselves, and the notes on them, can both be enjoyed beyond the reservations I have expressed in the previous paragraph, and that in no way should prevent anyone from gaining a great deal from interaction with this text. Indeed, I would recommend that nothing at all come between every potential reader obtaining this brilliant and important work as soon as possible.